Why Blog in Industrial Marketing? Catapult Your Company Past the Competition! That’s Why. Wait … what’s a blog? First: the basics. You’ve probably been reading blog posts for some time and may not know it. Maybe you read something a friend shared on Facebook or LinkedIn by following a link to a page with a cool post about something that interested you—either business or lifestyle related. It might even have been an industrial marketing blog post. A blog can take the form of a discussion or can be a (generally, but not always short) informational piece of content published on the internet and consisting of discrete entries. Blog posts can be part of a website or blogs can essentially be the website. Some blog writers position themselves as subject-matter experts or they might be enthused hobbyists who like to write about different aspects under one umbrella. Say, a foodie who writes about everything from the trendiest food trucks to their failed attempt at the perfect osso bucco at home. Get it? You say you don’t like osso bucco or food (but who doesn’t? ), and you might not feel the need to follow them, but you might want to read a blog from time to time on the trendiest new eatery in town. But a blog dedicated to your business interests—now that’s a different story. You’ll eat up (yup, pun intended) anything you can on the latest and greatest discoveries, hits, and tips on the best coatings for fabricated metals, innovations in plastics, or manufacturing efficiencies. So here comes the good part: why blogs are so useful to you. If you’re interested in these things and seeking out the info that matters to you, so is someone else. Lots of someone elses. This is critical because it creates trust and admiration for your company from potential customers. This is extremely important to companies because it instills a sense of care for your customers. If the customers feel that you are aware of and listening to their wants and needs, you are then viewed as a friendly ally. Not only do you want your customer to know that you know what you are doing, but you want to position yourself as a thought leader in your industry. Not only will customers respond to this, but the Googlebot spiders like it, too, when they see increased traffic and content shares traversing across the interwebs. Being a supplier of new and relevant content is crucial; it is what keeps customers coming back. If you visited a site only to see same old, same old, there is no incentive for you to surf on that site, let alone keep clicking on it once you land there. In with the new … constantly. After all, that’s what it’s all about. Today’s consumers are very adept at educating themselves. Often, they have already completed 60% of their consumer research before they come knocking on your door. Think of your blog posts as your welcome mats. Make them inviting. You may be thinking to yourself, Wow! That sounds powerful, but really? Do blogs really work? Yes, they most certainly do. 92% of blog users who posted multiple times a day acquired a customer through their blog; a figure that decreased to 66% for those who blogged monthly, and 43% for those who posted less than monthly, according to Marketing Charts. The numbers speak: blogs can work wonders for your company if used properly. Even if you do not update your blog daily or even weekly, you will still see upticks in customer traffic on your website. Blogs draw many potential buyers to your website, naturally strengthening your companies’ inbound marketing. If your company has a strong outbound marketing strategy, but a weak inbound strategy, blogging is a great place to begin. Even if you don’t think of yourself as an industrial marketer, you could still be a fantastic blogger, just by virtue of the specific industry knowledge you have. Yes, blogging takes work, but the heavy lifting is made lighter when you let customers come to you—already trusting you as a reliable thought leader. Implement an effective blogging strategy and your company will benefit substantially. Whether you do it yourself or hand it off to the pros, like the Massachusetts industrial marketing agency, Grant Marketing, you’ll gain the fighting edge over your competitors. And the only thing hoisted in the catapult will be your powerful reputation in the industry. 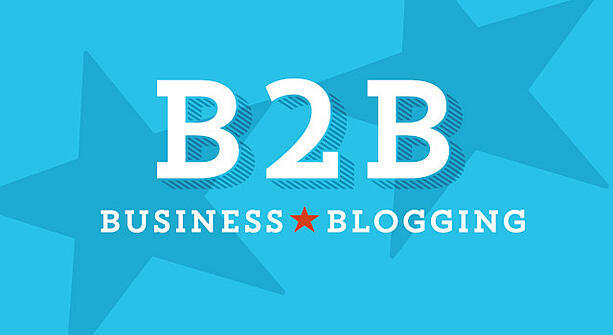 Without a doubt, a blog is a powerful weapon to have in your industrial/B2B marketing arsenal. As you decide whether a blog is right for your industrial/B2B company, it helps to understand how to integrate a company-wide blogging program into your industrial/B2B marketing strategy.